I have come across the problem I am writing about in the past and never found a solution for it online. It may have been due to the search words I was using or that SQL gurus find this query elementary and no one would ask. In any case, what I am talking about is retrieving two or more rows but filtering where only one of the columns in the multiple columns you are querying for is distinct. The above dataset (table) has 4 fields, customer number, order number, item number and time. If you notice each transaction records the cusotmer number, the order number, the item number and the time each item was rung up for an order. So a cumstomer number and order number will appear as many times as there is a different item purchased with each item having its unique timestamp. You would get every row. The preceding query was tested on Teradata. 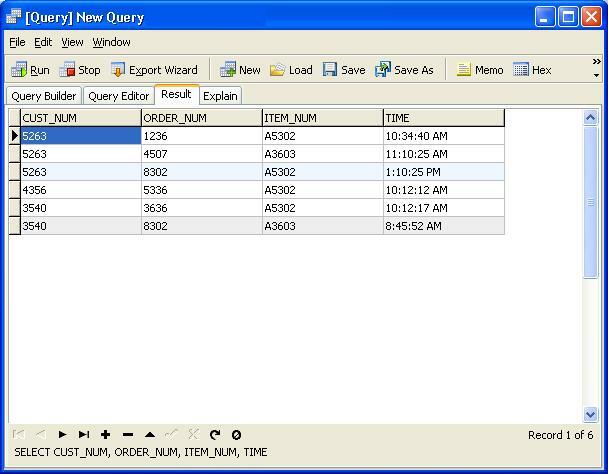 Example using the MySQL database. Also, I have tested the query below using the dataset above under MySQL. Then you would get the ideal set of rows we are after. I’m sure there are other ways, but if you ever asked yourself, how to I return multiple columns with only one row being distinct, well there it is. Multiple columns returned and based on only one distinct row. You are using SQL Server right? For email address in the distinct statement, try giving email address an alias like ’emad’. That should take care of the ambiguous column name error. I haven’t used SQL server a lot, but if that doesn’t get the query your looking for, let me know. I tried this on SQL Server. But I’m not getting distinct values as expected for email. Send me some sample data, list the fIelds that your data should be distinct on and let me know what version of SQL Server you are using. In this scenario I would expect 3 values to be returned but I get 5. Many thanks! That solution works. In my case I had no preference for which value was returned. I’ve got a non-technical database question. I downloaded Oracle for playing with at home. What is a good database to download to play with? and multiple relations between the tables. relationship-types between some of the tables. I am learning SQL and databases to practice on. You have mentioned IMDB is interesting. Could you please email me the IMDB in database format and other databses you have collected. I would like to work on them.My email id is aishyaraghav @yahoo.com. Your probably thinking, “I just asked about a database.” But with the XAMMP install, you will have access to an administrative backend for MySQL called phpMyAdmin. Here you can administer your database environment via a web user interface. As far as the datasets, I don’t know of any real interesting ones such as the IMDB one you have but the census bureau offers access to a lot of demographic data that you may find interesting. There is also an online application called data ferret (http://dataferrett.census.gov/) that you can utilize to download data in text file formats. I mention text files since you can upload text files of data into MySQL and easily create new tables with file imports. Anyway, if you have any questions during your search for interesting data, just post. I promise not to take as long to reply next time. SQL Joins get me every time, cheers for the above, most helpful. You would want to select distinct by Order_Num, based on the goal you are pursuing in your example. Most helpful, been stuck on this prob… now can get on with work! Thx! But it gives error. How could I do this ? Please Help. How would this SQL Distinct on one column only problem be solved in Oracle? I can’t seem to get it to work. I don’t have access to Oracle but I’d like to help you out. Send me your sample SQL and I’ll do what I can. I was just testing it on some databases I had, both in Access and in something called Oracle Express that I can access online. Neither worked. I don’t have a current project, but I just want to know this. I just used your code, which is below, and plugged in my own table and columns. It just didn’t work. But, also, I don’t know why Oracle would be any different. I just installed Oracle Express and I am stumped. Now I really want to figure this out. 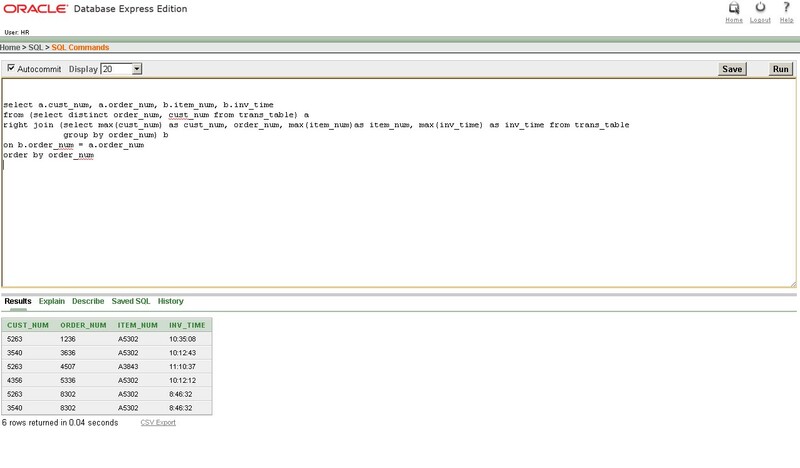 I know MySQL acts differently than Teradata, that’s why I included the MySQL example in the post. I think the SQL also worked for me with DB2 at some point, but I really can’t recall. Nevertheless, I’m going to keep messing with it via Oracle Express. I’ll post once I figure it out (or someone gives us the answer). Okay I figured it out. I changed the column time to inv_time in my example. Time is usually a reserved word in databases so I apologize for initially naming that column TIME. The following SQL should work. I’ve posted a print screen of Oracle Express in the post. I’m trying to make the IAURN unique. The query runs but it just produces the same data as I have in the original table. :S Any help, greatly appreciated. What database are you using. I haven’t tried the described technique on SQL Server, so it may be different. I was attempting to do it in Access. We’ve now managed to solve the problem using a bit of software but I never could get the query to work properly, most likely just because I had used it incorrectly. Thank you for taking the time to reply to my post. It will group by CUST_NUM and make that column distinct. Thank you sir! 😀 I assumed it was something like this, but having a blueprint helps. i am trying to get unique dscr but i keep getting repetitive values in this field. Any help or suggestions would be greatly appreciated. I need to update this post and your question is a reminder why, so thank you for that. Now, to your question, if case_id is a key field, then you can try the query below. It is much simpler and you should get what you are looking for. Email me if you have problems. Or text 512-481-2451. Also, I think the ON statement on your JOIN CLAUSE may have been mistyped. That is assuming “dscr” stands for description. But either way, I think the method below is simpler and will provide what you need. Isn’t there any easier way of doing this in MS SQL Server other than using ‘MAX()’ and ‘GROUP BY’ as my table contains more than 30 columns. In addition to this I am using ORM. Yes, and thank you for asking otherwise I don’t think I would have attempted to find a solution for it. The following is applicable to SQL Server 2005 through 2008.
where distinct_col is going to be the column that you want to group by, that is the one that you want to base your unique values off of. 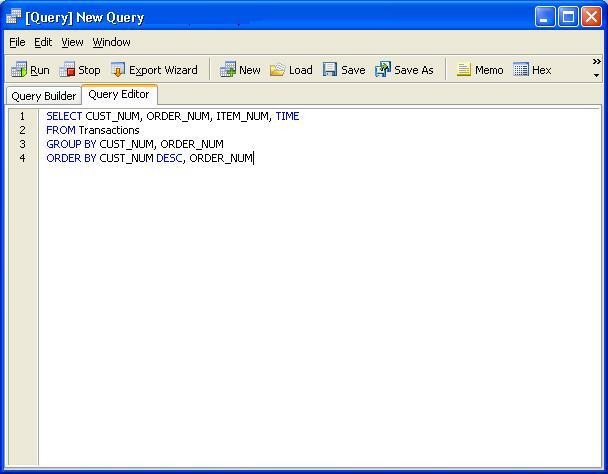 On SQL Express 2008, querying 6.5 million records based on 63 unique values with no indexes on tables, this query took 2.5 minutes to complete, so it may be computationally expensive. Thank you for you quick response. I tried it and works in MS SQL Server 2005 and above. But I need this in MS SQL Server 2000 as well. I tried to implement same technique in different way (i.e. creating row number) but it takes too long to execute(this table of mine is too big). Any simple idea how to do this in SQL Server 2000? Sorry don’t have SQL Server 2000 to test on. I’m sure you’d already thought of this, but if you have the sufficient space in SQL Server 2005, it may be easier to export the databases over. I would like to display 2 columns, but only the id is distinct. How can i select the distinct id and displaying the name if I am using progress database? I haven’t worked with Postgre SQL really but there are two possible solutions depending on your table. But that doesn’t seem to be the case, so . . . Unfortunately I don’t have Postgre so I can test the second scenario, but most of the databases that I’ve worked with have allowed the use of MAX() function with characters. If it doesn’t work, feel free to post another question. Thank you, worked perfect for postgresql. How can I do this using MSSQL? This is quite helpful, but I am unable to get it to work for my case. Can you please advise? I am using Oracle 11g. I have a users table that has columns username,company and I would like to get a list of distinct usernames and include the company as well. because every account is by definition given a distinct username. What I need to do is get a list of distinct usernames when I trim off the dash and initials. because of the unique spellings in the Company field. Unfortunately, I can not do the most obvious solution of fixing all the spelling differences, as I don’t have permissions to insert/update/create tables. I don’t really care which spelling of the company name is returned, if that makes it easier. I would appreciate any assistance you can provide. How did you get two customers on the same order number? Dummy data, I wasn’t paying attention to that. Good catch though. 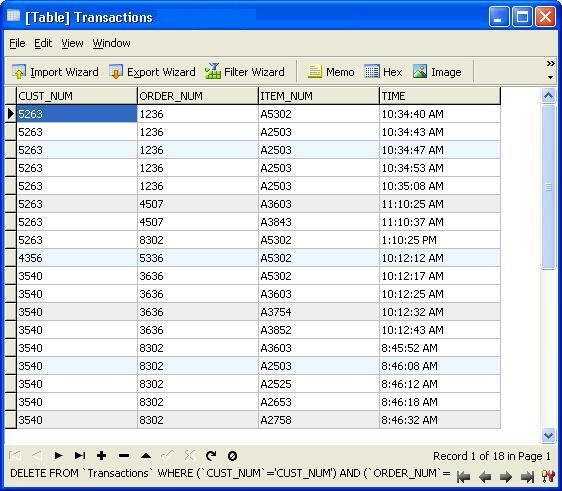 I have sql2005, have a table with many columns. I want to display several selected columns, but i want to get a distinct on one column and the most current record and excluding records that have and id that starts with rt. i know using distinct and max will do and was able get only item and date column only. I use SQLServer 2008R2. I just would to say that you did a terrific job with that query you have proposed to Prada on March 8, 2011 at 5:52 am. It worked like a glove for me. It’s 3:11am and I was stuck with this problem as all my development was relying in such solution with distinct. I tried your example and it didn’t work. I’m using MySQL. Maybe I’m doing something wrong? Thanks. It seems like the solution to your problem would be answered by with reporting software. Oracle may accomplish what you are looking to do with Grouping Sets, but I don’t know that MySQL can do that for you. The closest answer I can give you is to use ROLL UP. I added a client count to the query below, but you can omit it if that’s not of interest to you. Can anyone please help me? I am new to SQL. I have a table with some data of which two columns are id(varchar2) and name. I need to select distinct id and the names associated with it. I tried many of the ideas explained here but didnt work for me. I am using oracle. It worked great! Thanks a lot.. I have a problem. I’ve got a table which is as follows. I need to display just the supervisor and the name column of only the staff who are supervisors. So the result should contain 6 of them. This returns the numbers of the supervisors, but we are unsure of how to pull out only the names of these listed supervisors. There are rows in your ocReferral table where it doesn’t necessarily matter which ones are selected, as long as they provide proof that a record was created. You are more concerned with capturing names, ACCI and agency and that some relationship exists between that info and fields in the ocReferral. @oscarvalles, from what I understand, row_number() would be awesome to use, but I can’t, since this isn’t SQL 2005 – I’m working w/2000 on this database. Any other ideas? Glad to hear it. It sure beats the solution I worked out. http://www.box.net/s/fci82f8s069176o172ct Thanks for the update and sharing your code. I have been having this problem for a whil enow and can’t seem to implement it with my limited knowledge into my query string. There are two tables here as you can note the primary and foreign keys os customer ID. How would I display the results with distinct customer.ID field? If you have duplicates in both, feel free to send me a sample of the data or try using the technique described here: http://www.box.net/shared/y6boje6fhhv30y8jsrrh assuming you are using SQL Server 2005 or greater. Thanks, your solution to Prada helped me out greatly. Be sure to read the notes at the top. It will help explain the query and provide you with a performance tip. If you are not using SQL Server 2005 or later, then please submit your table and field names and identify which field(s) you wish to make the record unique and what fields you are joining your tables on.